Boeing (NYSE: BA) and key Japanese partners today signed a formal agreement for significant work on Boeing’s new 777X airplane. Boeing (NYSE: BA) and key Japanese partners today signed a formal agreement for significant work on Boeing’s new 777X airplane. The agreement finalizes last year’s announcement by Boeing, Japan Aircraft Industries (JAI) and Japan Aircraft Development Corporation (JADC) of a Memorandum of Agreement (MOA) to provide approximately 21 percent of the major airplane structure components for the 777X. The contract includes fuselage sections; center wing sections; pressure bulkhead; main landing gear wells; passenger, cargo and main landing gear doors; wing components and wing-body fairings. 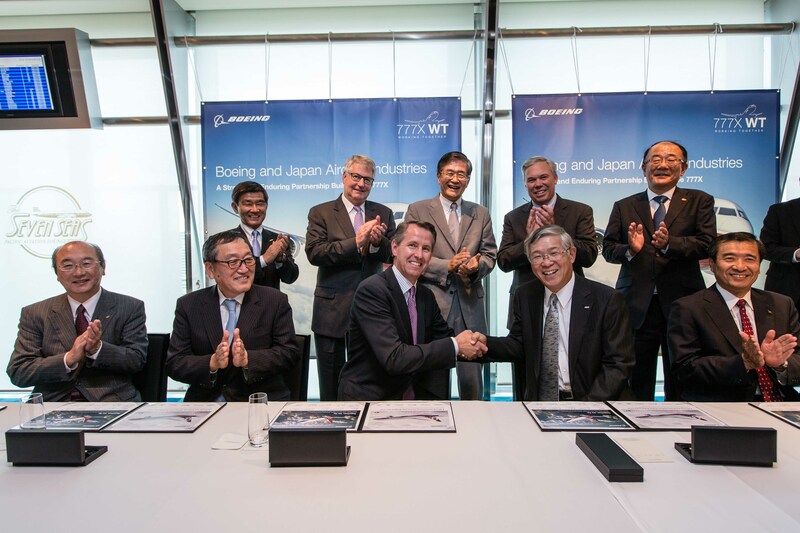 TOKYO, July 23, 2015 – Boeing (NYSE: BA) and key Japanese partners today signed a formal agreement for significant work on Boeing’s new 777X airplane. The agreement finalizes last year’s announcement by Boeing, Japan Aircraft Industries (JAI) and Japan Aircraft Development Corporation (JADC) of a Memorandum of Agreement (MOA) to provide approximately 21 percent of the major airplane structure components for the 777X. The contract includes fuselage sections; center wing sections; pressure bulkhead; main landing gear wells; passenger, cargo and main landing gear doors; wing components and wing-body fairings. JAI consists of Mitsubishi Heavy Industries (MHI), Kawasaki Heavy Industries (KHI), Fuji Heavy Industries (FHI), ShinMaywa Industries (SMIC) and NIPPI Corporation (NIPPI). JADC is a non-profit foundation established to enhance the competitiveness of the Japanese aircraft industry. Boeing has partnered with Japanese aerospace companies for nearly five decades to develop and manufacture the Next-Generation 737, 737 MAX, 747, 757, 767, 777, 787 Dreamliner, and now the 777X. In 2014, Boeing purchased more than $5 billion of goods and services in Japan, supporting tens of thousands of aerospace jobs. With this agreement in place, the company expects to purchase a total of approximately $36 billion of goods and services from Japan between 2014 and the end of the decade. Building on the passenger-preferred and market-leading 777 family of airplanes, the 777X family includes the 777-8X and the 777-9X, both designed to respond to market needs and customer preferences. The 777X program currently has 306 firm orders from six customers. Production is set to begin in 2017, with first delivery targeted for 2020.